I’m a pretty lucky guy. 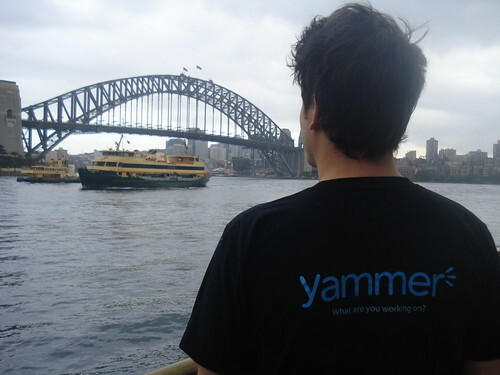 Today, I’m happy to be able to post and let you all know that I’ve just signed on to work with Yammer here in Australia. I’ll get to work with the current two APAC Yammerati and two great friends, Ross Hill and Bryony Cole. Yay! I started playing with Yammer when it launched in 2008. I was at World Vision Australia at the time and Keith Don and I had some fun seeing how it worked. The platform has changed markedly since then, and it’s exciting to see a company so immensely redefining what it means to work and collaborate together in a changing world. I’m excited to come on board and continue making that change happen and look forward to helping people and organizations grow thriving cultures of compassionate action and innovation. My role will be as a Customer Success Manager. Those of you that know me well will know I’ve always struggled a little to define myself and what I ‘do’. I’m really pleased to be able to better learn what that is with Yammer and can’t wait to get started. I’ll be helping people here in the Asia Pacific region transform their organisations and the way their people collaborate. We sometimes forget that organisations are collectives of people, pulled together to achieve a mission. Yammer is all about helping those collectives win. We’re also still hiring in the region, so check out the Yammer jobs page for more info. I’ll continue to be based in Sydney and to live with the amazing Rose Levien in our cubby house in Darlinghurst. Thanks also to all the people I’ve coffee’d/skyped/phoned over the past weeks for your thoughts, ideas and sage advice. You all know who you are. I certainly am a lucky guy. Welcome to Yammer, Steve! We’re so excited to have you! So happy to hear this news Steve. Perfect!! So when can *we* get an appointment with the new Sydney CSM? We’re ready to go. Welcome to the team Steve. Hopefully we’ll both be in SF at the same time soon. That’s fantastic news Steve! I have to say it is your destiny to work for Yammer! I’m sure Yammer will become a better product with your passion for change and new ideas. I’m so excited to have you on the team! Jumping on a plane to the HQ! That’s awesome news steve, congrats! Great success! Bring it on Mr Hopkins! It’s not luck Steve. Well done mate. Fantastic news Steve! A perfect next step! Congrats, Steve. I know you’ll be awesome. Yammer are a lucky bunch. Where in the world are you at the moment? Hope to be back in Oz sometime in Oh-Twelve. Ah, London is where you’ve ended up 🙂 all the best! Great news Steve, looking forward to meeting you soon! Great news Steve! Looking forward to meeting you soon! Thanks Luke! Likewise, I look forward to meeting you soon too! This is just wonderful news Steve ….. I am sure the role will suite you down to the ground.